Instead of a real post of my own, I’m just going to take a few moments to direct you to some poly-sweetness elsewhere on the web. First up, a lovely post over at the Strong Families blog about poly motherhood (and sisterhood) from a non-biological mama in a poly relationship. I’ve long been aware of Strong Families, and am a huge fan of their multi-racial, multi-family-style mother’s day e-cards. So I was particularly appreciative of them for including a piece from a poly perspective. It always especially makes me happy when an organization/blog/website/whatever that I already know and respect from the feminist part of my life is poly-inclusive as well. 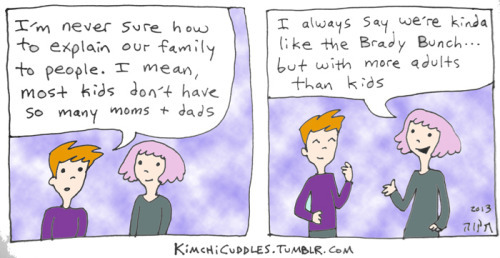 Thanks, Strong Families! Not all the posts are about poly parenting specifically, but they’re all cute and there are more than a few that I can relate to. Again with the appreciation, it’s always nice to have art/media/entertainment available that actually reflects our poly lives and experiences. And of course, every little bit of it is a part of our growing visibility. Finally, and having nothing at all to do with Mother’s Day: the fine folks over at Modern Poly have opened up a webstore, and they’re currently taking pre-orders for an assortment for T-shirts and buttons (and more fun goodies to come soon!) in a variety of “poly pride” designs, including a LGBTQ/poly solidarity design by yours truly. All proceeds support their poly advocacy work. This entry was posted in poly links and tagged kids, non-monogamy, poly families, poly links, polyamory on May 13, 2013 by Angi.